But, the discovery of this fact does not help us at all. Although we do not know why, we, the siblings who can trangender and crossdress the other, are so weird that we cannot say that this is impractical or something similar. Indeed, we do not know our abilities very well, since they haven't even been around for three weeks. Aside from staying home, we each have our respective lives, since we are in the first and second years of high school. If we activate our abilities too easily when in our private rooms, we will have to consider the basic behaviors of our daily lives. 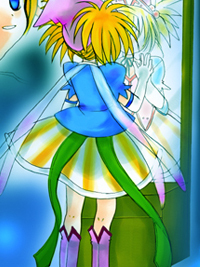 In short, Satori went to Ayumi's room and visualized that Ayumi was turned back, and then Ayumi walked home. When she was in my room, and when she was about to leave my room, we had many troubles that were too much for us, especially the severe cross-examination about female "Ayumi", regarded as a "different person". More than anything, Kyouko-chan, completely on female "Ayumi's" side, brought us lots of trouble. Furthermore, without our realizing it, she thought male Ayumi and female "Ayumi" come to date each other. He tried over and over again to make desperate efforts to deny the misunderstood, and he muddled through trying to change her opinion into "female Ayumi is one of male Ayumi's friends who occasionally comes to his house". The girl classmates of Satori were inevitably involved in the persuasion. For girls of their age, a rumored love affair about the classmate's brother would be more than sufficient to keep an all-night vigil. Though they were one year behind Kyouko and her classmates, they opened up to each other and became good friends. Of course he could not study for the examination at all. First off, it could not be crammed in just one day. Though, I managed to do that when I was in my 1st high school year. Really, what help does studying provide for me? The things I memorized just now will be gone, not in the far future but in just a few months. I am not confident of this but I am pretty sure that I have completely forgotten things like dates I memorized for the mid-exam in my junior-high school. . . .or something, that I had considered as complications, but the thing I should do is just pass the exam. The brother and the sister finished dinner as usual, so that their mother would not notice that her own son, every day, wore gorgeous female outfits she had never worn, and each went back to their room. Shortly afterward, the Jojima siblings had a meeting in Satori's room. ". . . I might have done too much." My sister, of course, has no sense of guilt. "Well, but we have to consider our plan." "I do not like it. I want to stay in my room." That is quite natural. It is hard to accept a plan that makes Satori refrain from staying in her own room, to keep her brother male. Keep it all very simple. . . I will explain. "Well, fortunately or unfortunately, we are going on a vacation in summer." ". . . But we aren't certain whether these things are temporal." "That is entirely the point. . ."
Ayumi folded his arms, mentally tearing at his hair.